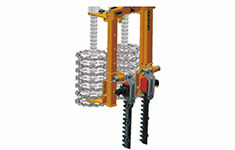 Frame with two disc modules equipped with blades cutting through shearing movement. Discs driven by two hydraulic motors. Centralisation of all pre-pruning functions in a drilled block. 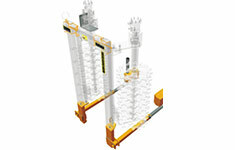 Manipulator for opening closing of modules. Rotation of discs at a speed of 260 rpm. Two versions available (short and long frame) with stacks of 6 to 28 discs and gap of 60 or 90 mm. Working speed up to 10 km/h. A particular configuration of this equipment ensures the respect of environment (stakes and tying cords). The shape of the disc ensures a good grip on the vine shoots and a regular feeding of the machine, without damaging the tying cords. Centralisations of functions in a drilled block. 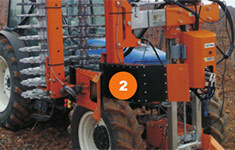 Customers already owning a MP 122 pre-pruning machine can fit ground discs on it without modifications to their machine. Optical detection works on all types of pickets (wood, steel, concrete) but there should be no leave. It is also necessary that the pickets should be without perforations in the scanning axis; and of a cross-section greater than or equal to 25 mm. The detection is by inductive sensor is possible only with steel pickets but on the other hand, pre-pruning can be carried out immediately after the grape harvests even with the leaves remaining. The pre-pruner MP 122 can be optionally equipped with an automatic opening on passage of pickets with detection by infrared scanning or inductive sensors. These two systems each have their specific characteristics. Pair of lateral cuts allows cutting the sides of vines in cordon. They are delivered with a manual setting of the cutting angles and width. Connected in series with the pre-pruning head, they do not require additional oil flow.